The table of assets and spreads can be found in the 'Execution conditions' section of the Darwinex website. Additionally, you'll need to know the number of contracts (lots) you are trading. The table indicates both the standard contract size (100,000 of the base currency) and the minimum tradeable size (usually, 0.01 contracts). 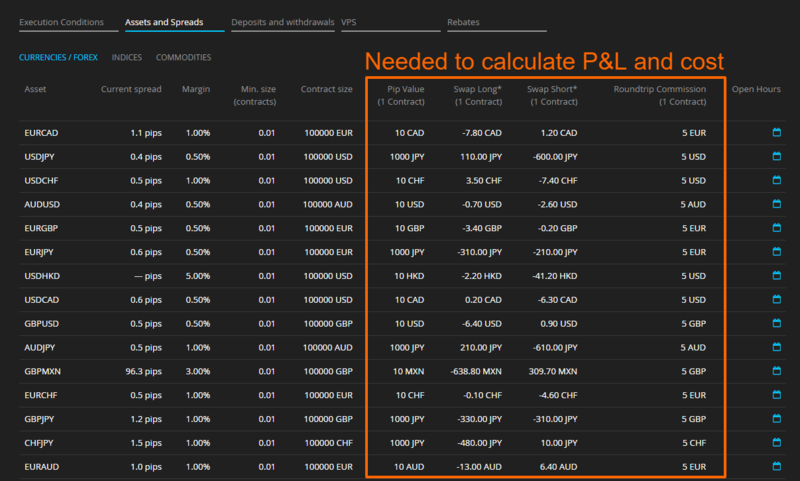 You can calculate the P&L of a trade by multiplying the pips gained or lost by the pip value and the number of contracts. A pip is the fourth decimal of the price of a currency pair with the exception of currency pairs ending with JPY in which case the pip corresponds to the second decimal. The value of a pip is determined by the second member of the currency pair, known as the counter or quote currency, and has a fixed value in that currency. For example, every currency pair that ends in USD (GBP/USD, AUD/USD, etc.) has a fixed value of $10 per pip per standard lot. However, a currency pair that ends in GBP (such as EUR/GBP) has a fixed value of 10 British pounds per pip per standard lot, and a currency pair that ends in CHF (such as USD/CHF) has a constant value of 10 Swiss francs. When you do your calculation this way, the result you'll get will be the P&L in the quote currency (USD in the case of AUDUSD). Another way of calculating P&L of a trade is based on price according to the formula (close price - open price) / open price * nominal value of the trade. If you take this route, the P&L will be denominated on the base currency (AUD in the case of AUDUSD) and not on the quote currency. For displaying P&L in the Metatrader terminal you may choose between points (1 pip = 10 points), term currency (same as quote currency or the second part of the currency pair) or deposit currency. 'Profit' in MT4/MT5 does not include the cost of a trade. Only the amount that appears in bold in the last row of of the 'Profit' column includes cost (commission and swap). For currency pairs we charge 0.0025% of nominal value traded or a competitive 0.005% round trip. The whole round trip commission gets charged at the opening of the trade and no additional commission is charged afterwards. For calculating the commission, it´d be as easy as to multiply the number of contracts by the commission indicated in the table of assets and spreads. In the above example using a microlot (0.01 lot), it´d go as follows: 0.01 * 5 AUD = 0.05 AUD. If the AUD is not the base currency of your account, Darwinex would convert AUD into your base currency -EUR in our example- at the current rate. Currently 0.05 AUD equals to 0.03 EUR as you can see below. When holding on to positions for longer than a day, investors borrow a currency (on which interest is payable) to invest in another (on which they earn interest). Net interest is settled on a daily basis at 21:00 UTC and it shows the difference between interest paid and earned. Swap settlement is positive whenever interest earned on the invested currency exceeds interest on the borrowed currency - the investor gets paid. Swap is a cost whenever the opposite is true. Darwinex passes its inter-bank funding costs on to customers without mark-up. Swap is always displayed in the base currency in the Metatrader terminal. Swap for currency pairs is charged daily at 21:00 UTC, in triple size on Fridays.